Time goes by very quickly and it seems like yesterday that we were in the year 2004. Yet 15 years have already passed. Do you remember these events from 2004? (Listed in no particular order). The summer games of the XXVIII Olympiad were held in Athens, Greece. NASA’s Spirit rover arrived on Mars. Roger Federer won the men’s singles final at Wimbledon. The term blog was Merriam-Webster’s word of the year. The highest grossing film was Shrek 2. The Nintendo DS was released. Ireland became the first country in the world to ban smoking in all work places, including bars and restaurants. The Oscar winner for best film was The Lord of the Rings: The Return of the King. The most popular name for girls born in this year was Emily. The most popular name for boys born in this year was Jacob. The first privately funded spacecraft, SpaceShipOne, reached space. Qantas launched its discount domestic airline, Jetstar. Mary Donaldson married Frederick, Crown Prince of Denmark in Copenhagen to become Mary, Crown Princess of Denmark. 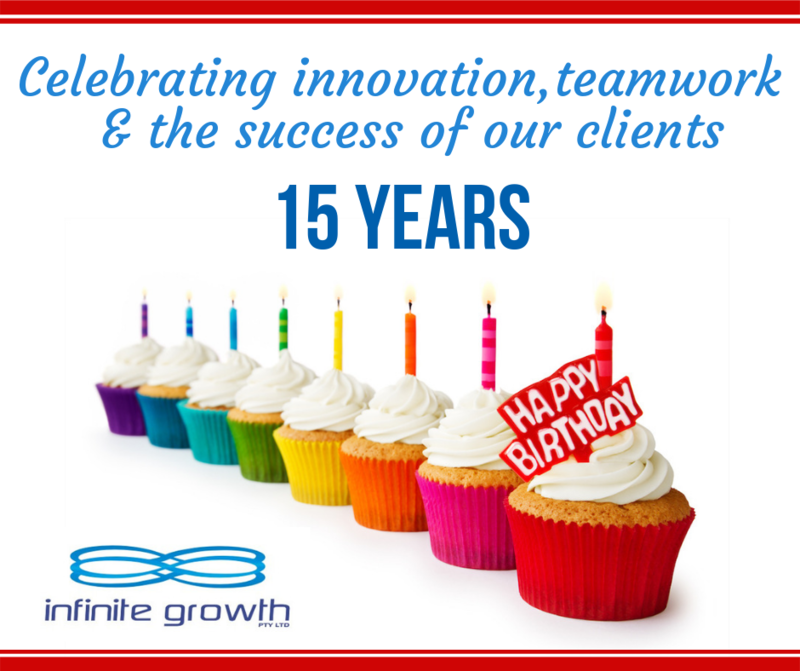 On 8 April, Infinite Growth turns 15. In honour of the day, I thought I would share my reflections of the past 15 years. The company’s focus from the outset has been to provide a quality service to our clients, who have always been our top priority. When I began the company, I focused on designing and delivering programs that were tailored to the client’s specific communication needs, which enabled those needs to be addressed in a timely manner. Initially, programs were delivered in a workshop format. With our clients’ changing needs, we’ve innovated so that we can still deliver a quality service that works with their busy schedules. Together with bespoke workshops, personalised coaching sessions for individuals and teams have also been introduced. We have utilised the advancements in technology to serve our clients’ needs for anytime, anywhere learning. Recently, we launched online programs with the option of also having online coaching sessions included. Then there are the tailored online coaching programs which are designed specifically for the individual’s or team’s needs. These programs can be accessed by professionals anywhere in the world. Technology has allowed us to provide more people with the tools to grow in their chosen field – as individuals, teams and businesses. The publication of my book, Success Talks: Conversations with Everyday Leaders, was the result of wanting to bridge the gap between the perception of leadership belonging to an elite few, and the reality that there are everyday leaders walking among us, making a difference in both business and society as a whole. Infinite Growth has been recognised in both national and regional business awards and our blog has been named one of the top 20 business blogs in Australia. These achievements have inspired us. However, the feedback that we receive from our clients has been the main motivator for us to continue providing a high standard of service. The needs of our clients are and have always been our main focus. As a result, we have had loyal clients for many years now, which is a humbling experience in itself. Infinite Growth was founded on the belief that every person has the potential to grow in knowledge and skills… infinitely. That belief is as strong now as it was 15 years ago. As my team and I celebrate 15 years in business, we look forward to getting to know more clients as they join us on the next exciting stage of our journey. Contact us to find out more about our programs or to book a complimentary strategy session. Nice to see you classifying the foundation of your company in the same list as Facebook, Mary Donaldson’s wedding, and NASA’s ‘Spirit’ Rover arriving on Mars.